With a South Ocean Boulevard address, this North Myrtle Beach resort is in the beautiful Crescent Beach section of North Myrtle Beach, South Carolina. The condominiums at Crescent Shores are quite large. They have three or four bedrooms and some of these North Myrtle Beach rentals can sleep up to 16 people. Experience the perfect North Myrtle Beach vacation with your family where the Atlantic Ocean is steps away from the pool deck. There are two walkways that lead from the pool deck area at Crescent Shores to the waterfront. Your beach access simply could not be any easier. Take your sand bucket to the beachfront and collect beautiful seashells. They make wonderful souvenirs of your beach vacation at Crescent Shores. The kids might want to hunt for sharks’ teeth while you scan the white sand for smooth beach glass that is popular these days with jewelry makers. 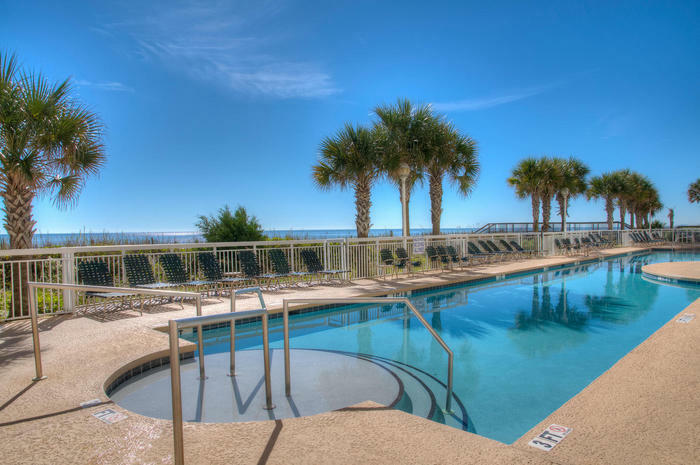 Crescent Shores is a North Myrtle Beach resort that has a stunning oceanfront pool deck. The sparkling blue swimming pool and the hot tub face the Atlantic Ocean so you can see the soaring seagulls, passing sailboats, cruising dolphins and nose-diving pelicans from your poolside perch. Go down to the pool deck first thing in the morning and watch the sun come up over the Atlantic Ocean. Take your camera with you to this amazing sight as the sky fills with color and signals the start to your memorable North Myrtle Beach vacation day. This high-rise North Myrtle Beach resort has two towers that face the oceanfront. Each Crescent Shores tower has an oceanfront pool deck. Collectively, the pool decks at this North Myrtle Beach resort boast a swimming pool, a couple of hot tubs and a lazy river. There is also a kiddie pool so even the youngest members of your family can safely play in a pool. There is an indoor swimming pool at Crescent Shores, too. So if you spend your North Myrtle Beach vacation at this resort when the weather is slightly cooler, you can still enjoy a swim. The indoor pool faces Ocean Boulevard and spreads out the water amenities at this North Myrtle Beach resort. Elliott Beach Rentals is not affiliated with onsite management or the HOA of Crescent Shores.